Like many other local historians in Dover, I feel strongly that there should a special place set aside to show aspects of Dover’s sea-going history. This facility, if I had my way, would include a section on the Train Ferry Dock. Not only has it a special place in Dover’s maritime history, but the design was revolutionary at the time and served as a prototype for the Thames Barrier. The story of the Train Ferry dock goes back to 1869 when the original Cross-Channel sleeper service was introduced. Then, passengers were required to catch the train in London, alight in Dover, embark on the night sleeper ferry, disembark at the Continental port and then catch a train to Paris or Brussels. The return journey was equally as disruptive. To run a service where that passenger could stay in the same compartment between London and a Continental capital without alighting was problematic due to Dover’s tides. The maximum difference between high and low tides at Dover is some 23-feet; however, by the 1920s advances in technology appeared to make such a service possible. Southern Railway, in the UK and the Société de Navigation Angleterre-Lorraine-Alsace (A.L.A.) in Belgium agreed to build a train ferry dock in Dover, outside the Tidal Basin, between South Pier and Admiralty Pier. 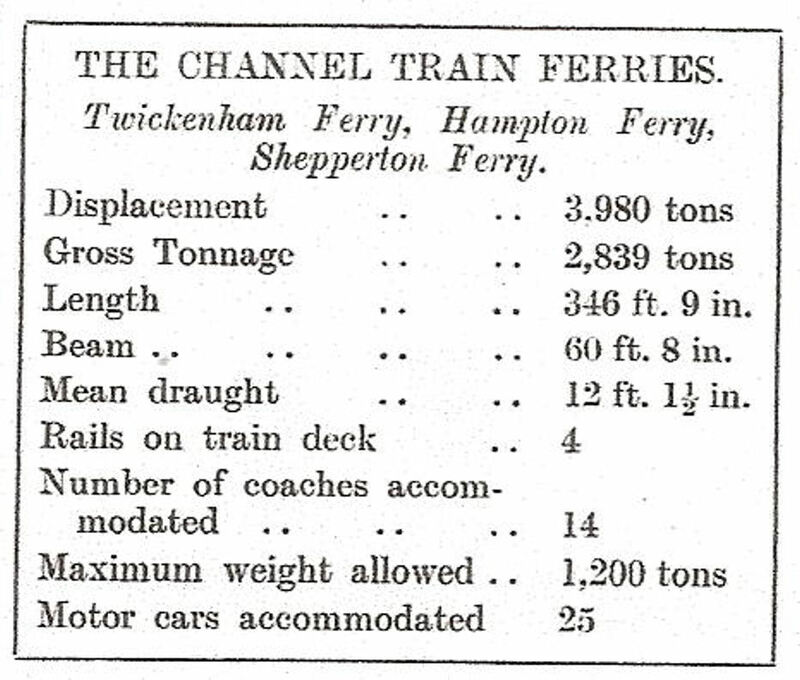 The specifications, drawn up by George Elson*, Chief Engineer of Southern Railway, was a concrete dock 414-feet long and 72-feet wide, with a minimum depth of water of 17-feet to a maximum of 36-feet. John Mowlem & Co. along with Edmund Nuttal, Sons & Co. were given the contract and work started in August 1933. 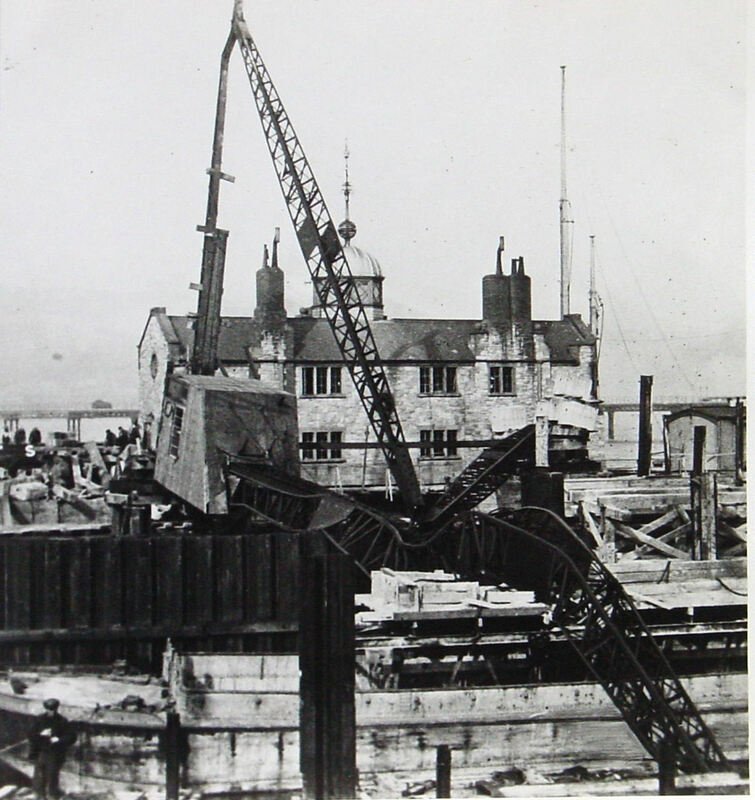 Initially a cofferdam was to be built using piles of sheet steel within which the dock was constructed. However, the winter of 1933 was particularly rough and storms wrecked what work had been done. Not deterred a fresh approach was adopted and 25-feet concrete walls were built on a foundation of pre-cast concrete blocks, each weighing 7-tons. The concrete blocks were put into position by divers and were bonded together to withstand pressure from outside. 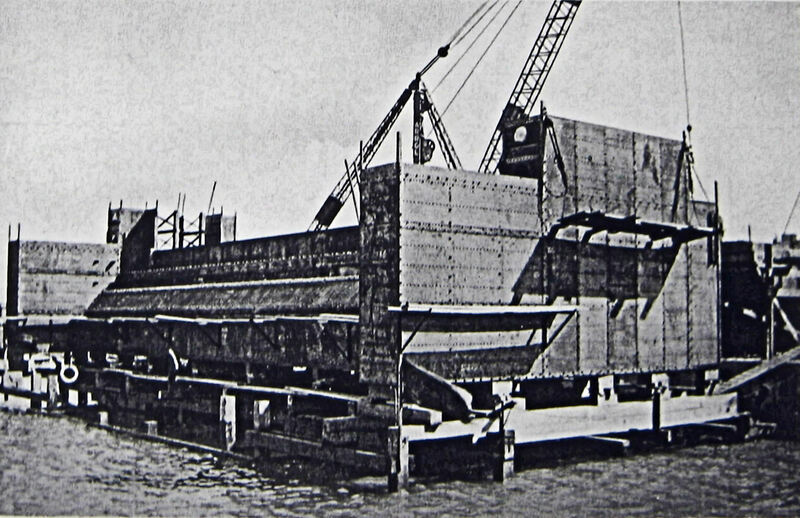 A caisson, weighing 525-tons was floated down from the Tyne and positioned within the concrete walls. Water was then pumped out and the dock built. Unfortunately, fissures in the chalk percolating through the bottom caused significant leakage. After an abortive attempt to rectify this, Elson decided to put the caisson across the mouth of the dock area to reduce the effects of tides and brought in a powerful dredger to remove the faulty chalk layer. The bottom was then covered with thick concrete laid by divers in strips of 80-feet x 5-feet. Laying the dock sill and fitting the two gates posed more problems. William Arrol & Co. – leading Scottish civil engineers made the Gates, and each one weighed more than 300-tons. They worked on horizontal hinges fixed below the dock sill. When open they would lie at the bottom of the lock to allow access and egress of the train ferry. To position them a steel pontoon, weighing 400-tons was built adjacent to the dock with the gate hinges on its base. The pontoon was then sunk across the entrance between guides to ensure accuracy and filled with concrete. The gates were then sunk and the hinges secured. However, while work was taking place a steam railway crane toppled over the sea wall causing considerable damage. The gates, designed to operate singly to enable easy removal for maintenance without disrupting the service, were in place by the autumn of 1936. Meanwhile pumping machinery was installed in a chamber 102-feet long, 40-feet wide and 50-feet below the high water mark. It contained three sets of centrifugal pumps, each of 270 horsepower and collectively capable of moving 120,000 gallons of water a minute! In 1932, Dover council decided to take electricity from the Grid to try to ensure a stable supply. Pylons were erected, transformer houses built and a cable supply was specially laid to operate the pumps costing £1,065. Two rail-lines were laid to connect the dock to the main rail-line at the same time, William Arrol & Co. erected a link span to connect the rail-lines to the ships. For sidings, 1.8 acres of land was reclaimed and named Clarence Quay. A 362-foot approach jetty, against which ferries could be warped before entering the dock, was also built. The Dock cost £231,000. At Dunkerque, A.L.A. was not faced with the problems experienced at Dover. The only special need was the provision of an adjustable bridge and motor ramps. It had been agreed that Southern Railway would provide three purpose built ferries. Built by Swan, Hunter & Wigham Richardson, Newcastle-on-Tyne, they were the Twickenham, Hampton and Shepperton. 2,839 tons each, they were coal-fired and had an average speed of 15 knots. The length was 359-foot; 63-foot 9-inch beam and 12-foot 6-inches draft. Each ship was designed to take 12 sleeping cars, 500 passengers during the day, or approximately 40 goods wagons. There was also a small floor above the train deck to accommodate approximately 20 cars. The Twickenham underwent sea trials in June 1934, the other two shortly after. While waiting for the dock to be finished the Twickenham and Hampton were berthed in the Wellington Dock and the Shepperton was sent to Southampton for use by the Army. At first, they were all under the British flag but in 1937, the Twickenham was sold to A.L.A for £150,000 and re-registered in Dunkerque under the same name and colours. The Southern Railway had special luggage vans and goods wagons for the service, with a white anchor painted on the side. On the train deck of the ships was a system of jacks and chains, the former to take the weight of the carriages off their own springs, the latter to hold each carriage securely in position. There were also two island platforms, enabling passengers to leave the train and explore the ship during the crossing. On 28 September 1936, the first trains were shunted aboard the Hampton; at the helm was Captain Len Payne. He had also brought the train ferries from the builders’ yard to Dover and was the Captain on Monday 12 October when the formal crossing was made. The Hampton, dressed overall with flags and bunting the official crossing was to Calais and back with many distinguished guests on board. These included the Home Secretary – John Allsebrook Simon, 1st Viscount Simon (1873-1954), the French Ambassador, British and French railway officials and the Lord Warden of the Cinque Ports – Major Freeman Freeman-Thomas, 1st Marquess of Willingdon (1866-1941). Calais was chosen as the crossing to Dunkerque would have taken about three hours and forty minutes and was considered too long for the occasion. The night service between London and Paris was officially inaugurated by the French Ambassador on 5 October 1936. The train left Victoria Station at 22.00hrs and arrived in Paris at 08.55hrs the following day. 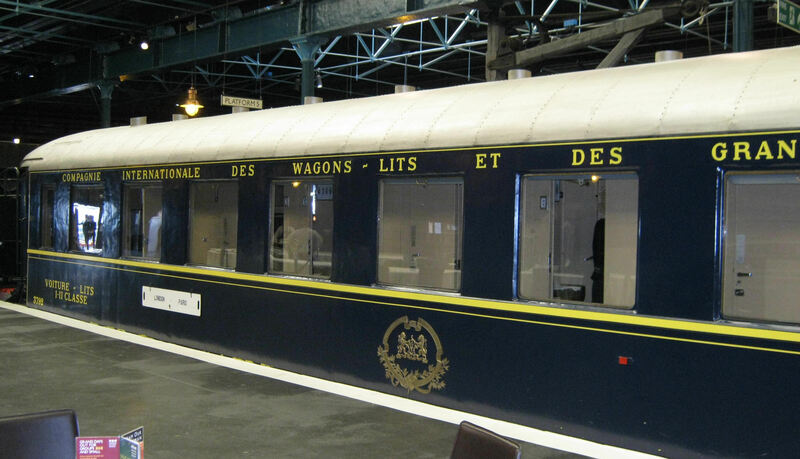 Featuring newly constructed, blue liveried, sleeping coaches from the French, Compagnie Internationale des Wagons-Lits, it was nicknamed the Blue Train. Adapted for the British loading gauge, each overnight train carried up to five and occasionally six, sleeping cars and because of their weight, the train was double-headed. The counterpart left Paris for London and there was a daily goods service via the ferry, which allowed the commodities being consigned to and from any part of the Continent without transhipment. 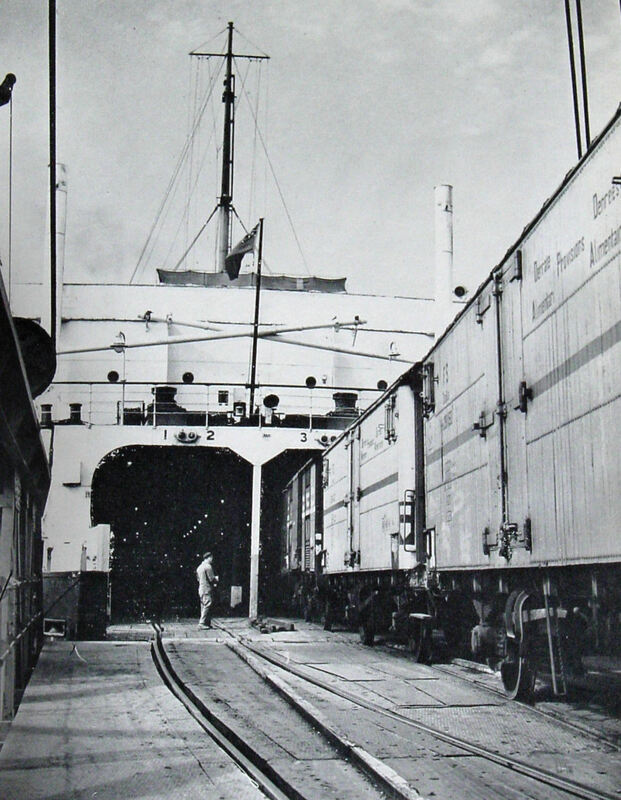 Facilities for the shipment of motorcars to and from the Continent by the train-ferry service were inaugurated on 28 June 1937, when a ramp connecting the shore with the steamer was used for the first time. The ramp enabled motorists to drive direct into a steel garage with room for 25 cars. The garage, on the top deck was fire proofed, and motorists were able to leave petrol in their tanks. The first car to be placed on the ramp was an 1898 Benz, a member of the Veteran Car Club that had been loaned for the occasion by Major Allday. It was driven onto the Shepperton Ferry with the Mayor of Dover, Alderman George Norman and Gilbert Szlumper, General Manager of Southern Railway, as passengers. 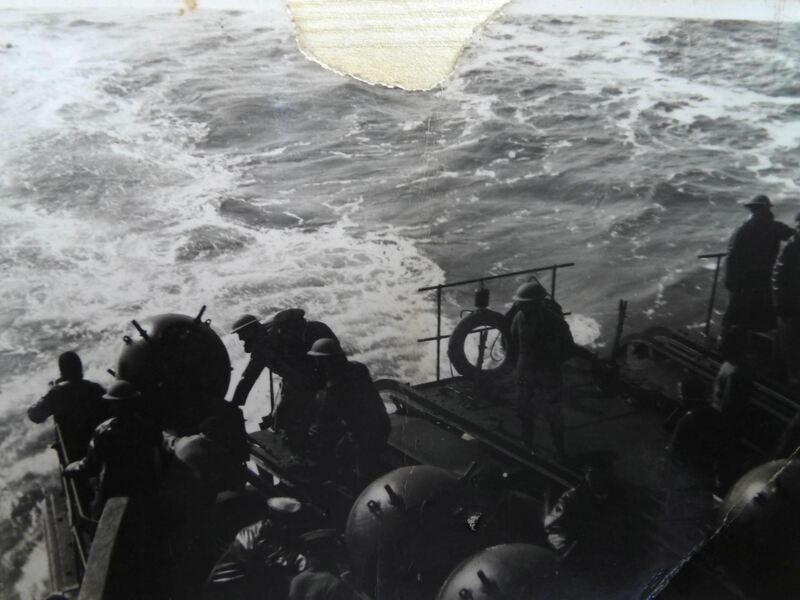 As the war clouds gathered, the ‘Night Ferry’ made the last crossing on the 25/26 August 1939. War was declared on 3 September and the Royal Navy requisitioned, for mine laying, the two British train ferries as HMS Hampton and HMS Shepperton. Refurbished to carry about 300 mines, narrow gauge railway lines were welded between the existing railway tracks on which the mines were carried in cradles to be launched at the stern from the train-deck. Between December 1939 and May 1940, mines were laid in the Channel and southern North Sea by the two train ferries and two Royal Navy minelayers. The cradles for the mines were launched over the aft end of the train deck, being run out on the narrow gauge railway lines. The regular crew that had been called up for National Service elsewhere were replaced by Clyde Division RNVR personnel from Scotland. Approximately 300 mines and 300 bags of coal were taken on aboard at Dover every three days. Hampton and Shepperton were also involved in the evacuation of troops from Dunkirk but shortly after the Hampton made an unsuccessful attempt to evacuate the 51st Division from St Valery-en-Caux and Le Havre. Both ships were involved in bringing troops from the USA. The train ferry dock, meanwhile, was used to house motor torpedo boats. Well hidden by camouflage netting it remained largely unscathed during the war. 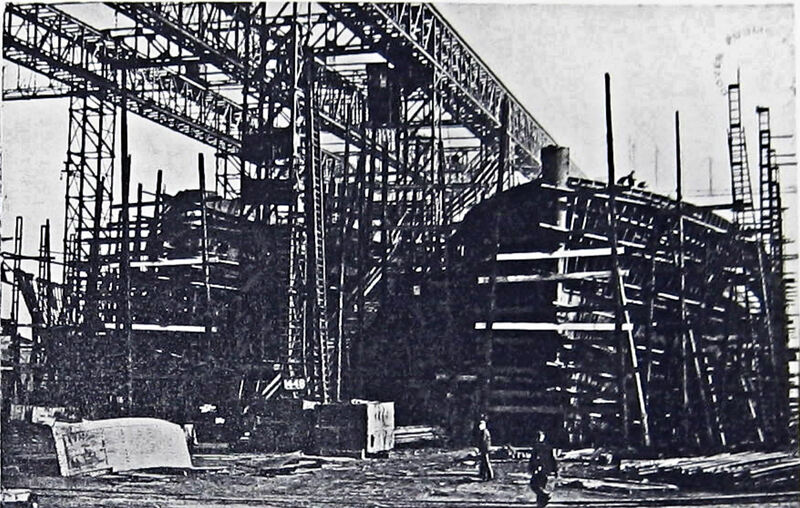 Following D-Day (6 June 1944), large gantries, weighing 258-tons and capable of lifting 84-tons were fitted to both ships above their aft superstructure. 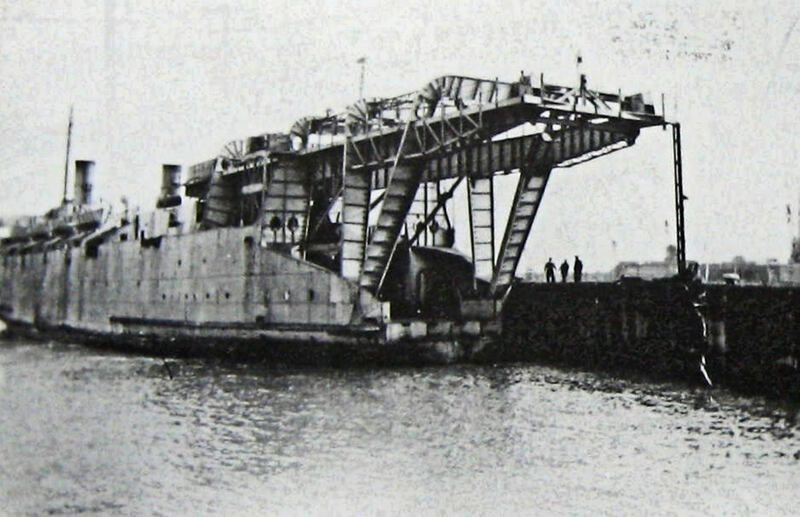 These were to manoeuvre dismountable platforms that could be used as a bridge between the vessel and shore. It was expected that most of the Channel Continental port facilities would have been sabotaged so the platform was to be used to discharge locomotives on to purpose-built hards with railway connections. 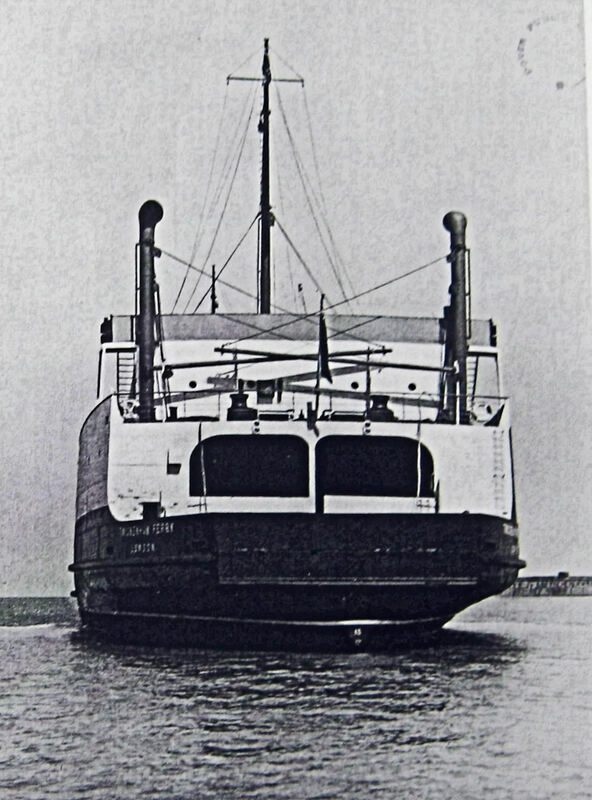 By early 1945, both vessels were crossing the Channel regularly for this purpose, mainly to Calais, where the rail connection was almost intact. Of interest on this point, Adolph Hitler (1889-1945) had given the order, before the Battle of Britain in 1940 that the port was to remain serviceable as he planned to cross the Strait by sea to receive Britain’s surrender from George VI (1936-1952). Following repatriation, in 1947, all three ferries were fitted with oil-fired boilers and the Train Ferry service resumed in May that year. In October, the American Loan crisis led to a complete ban on pleasure travel abroad and the service was severely reduced. Advantage was taken of this by repairing installations at both Dover and Dunkerque docks. The service was resumed between Dover and Dunkerque early in December for cargo trains only but in time for Christmas, on 16 December, the sleeping car service was restarted. In 1950, the ships were fitted with additional flooring on the train deck to allow them to take approximately 100 cars and also lorries. 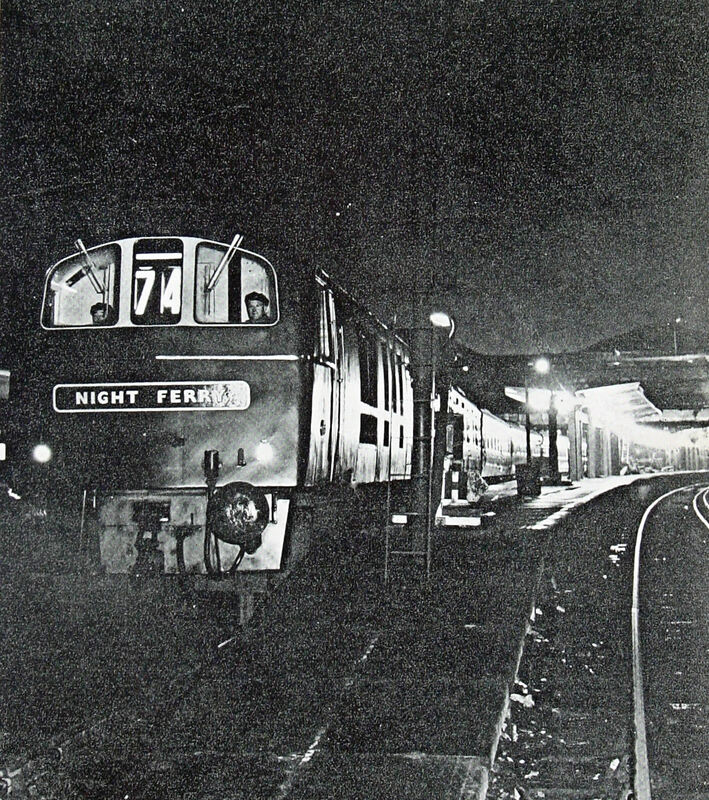 On 2 June 1957, a ‘Night Ferry’ service was introduced to Brussels and in 1961-62, the electrification of the line to Dover was undertaken. In January 1962, the Hampton went to the rescue of the crew of the Yugoslav steamer Sabac, which weighed 2,811 tonnes, when she was struck by the London steamer Dorington Court, weighing in 6,223 tonnes. At the time, there was thick fog and along with Dover Lifeboat, the crew of the train ferry searched for survivors. Of the Sabac crew of 33, only five survived. Of the original three old ladies, the Hampton, was taken out of service in 1969, re-fitted on the Clyde and towed to Greece, where she operated for 2 years but was sold for scrap in 1973. She was replaced by the Vortigern. Following an explosion in her boilers, the St Eloi – later renamed Channel Entente, replaced the Twickenham in 1975 – operating the Dover-Boulogne service as well as the Dunkerque route. She was designed to carry rail wagons as well as cars and lorries. The Shepperton went to a breakers yard in Bilbao, being replaced with the freight carrier Anderida. Other ships sailing the route were the St Germaine and the Chartres. By 1976, the decision had been taken to expand the port of Dunkerque and the train ferry berth moved to the newly built port of Dunkerque West just east of Gravelines. This cut the crossing time to 2½hrs. In August 1978, saw the millionth post-WWII passenger using the service but on 1 November 1980, the last overnight sleeper train arrived in Dover at 06.30am. The final passenger service, on the St Eloi, was on 27 September 1985. 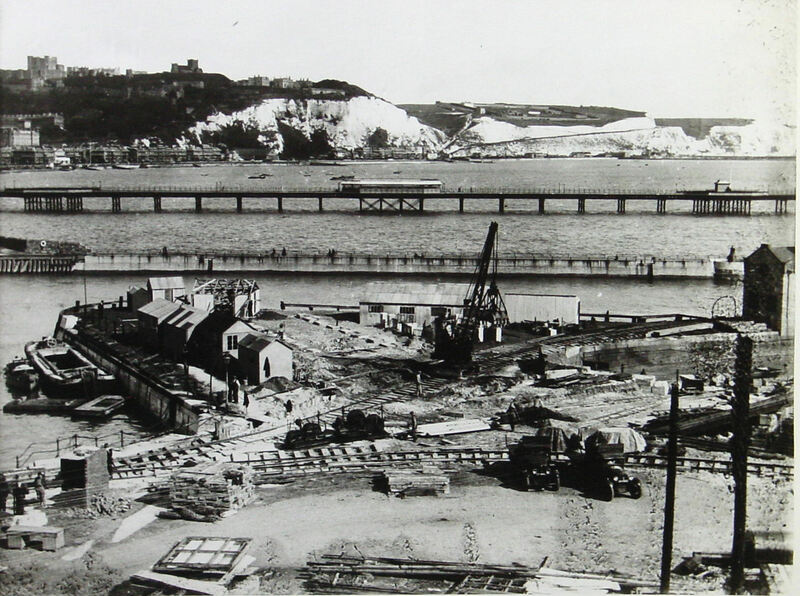 The original Dover Train-Ferry dock closed on 8 May 1987 and the area used as a depot for importing aggregates for road making. During 1987/88, a new Train Ferry Berth on Admiralty Pier, costing £2.8m, was constructed by W A Dawson. Designed to accommodate vessels of 23-metre beam it could be modified to allow ships of 30 metres beam. The link span was computer controlled to meet the different states of the tides. The Nord Pas de Calais (NPC) was the only designated ferry. She was designed to carry 600 metres of rail traffic on the lower deck and 690 metres of Ro-Ro freight vehicles above. The loading bridge and machinery, built by Cleveland Bridge, cost £34.6m and the associated sidings were constructed by British Rail for £0.35m. However, the Great Storm of 1987 reaped havoc on the construction time. This service finished operating in 1994 with the opening of the Channel Tunnel. * Dover Train Ferry Dock by George Elson. Journal of Institute of Civil Engineers, Vol 7 1937. This entry was posted in Port and Transport, Train Ferry Dock and Train Ferries, Train Ferry Dock and Train Ferries. Bookmark the permalink.